Planning permission, drawings and computer aided modelling. Combining in-depth traditional timber framing knowledge and expertise in CAD modelling we can produce accurate 3D frame designs, planning documents and precise drawings for building control. We design all our frames from the ground up, no standard models that get modified! Typically simple conceptual drawings are created before asking for any level of commitment. Our understanding of current building control regulations and structural sizing of timber frame elements allows us to optimise the frame aesthetic within the building envelope. This drawing was supplied for the Orchard Barn project to assist with the planning application process. It’s a fantastic looking barn & eco building project. All of our frames are jointed in the way they were centuries past, possibly millennia ago. In fact, simplistic mortice and tenon joints were used to locate the sarsen stones on the historic monument of Stonehenge. That’s serious British heritage! Combining in-depth traditional timber framing knowledge and expertise in Computer Aided Design (CAD) modelling we can produce accurate 3D frame designs. Your bespoke frame would be designed and refined using powerful CAD software enabling you to visualise your frame in 3D, making any key decisions at the initial stages. 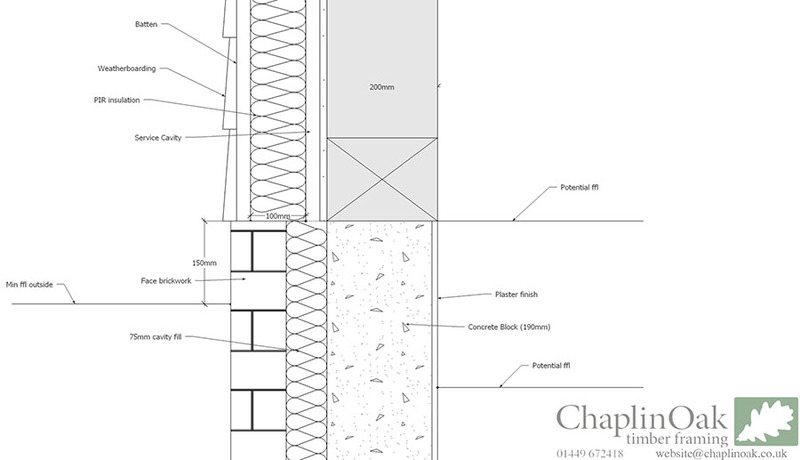 We can then create scale drawings sufficient for both planning permission and building control requirements. We can also help manage your planning application and/or listed building consent with appropriate drawings. We also supply frame drawings for timber framing companies outside of our working radius (East Anglia).